Truth is, it is never too early to bring your baby to see the dentist. At Downtown Dental Group, we recommend that you bring your baby in for a “Get Acquainted” visit as soon as their first tooth comes in. We know that for most children, that is at around 6 months of age. Some are sooner, and some are later, but the earlier your child comes in, the better. The American Academy of Pediatric Dentists also recommends a first dentist visit as soon as their first tooth comes in. They also state that this first visit should be no later than their first birthday. Dental disease is the most common chronic disease in children. It is our goal to help children prevent cavities and gum disease that can cause problems as they age. Another reason we recommend seeing the dentist as early as 6 months is because tartar can begin developing early on due to your child’s diet. Once they have teeth and they can eat different kinds of foods, tartar begins to develop. A “Get Acquainted” appointment introduces your child to the dentist and is a good opportunity for an exam of incoming teeth. 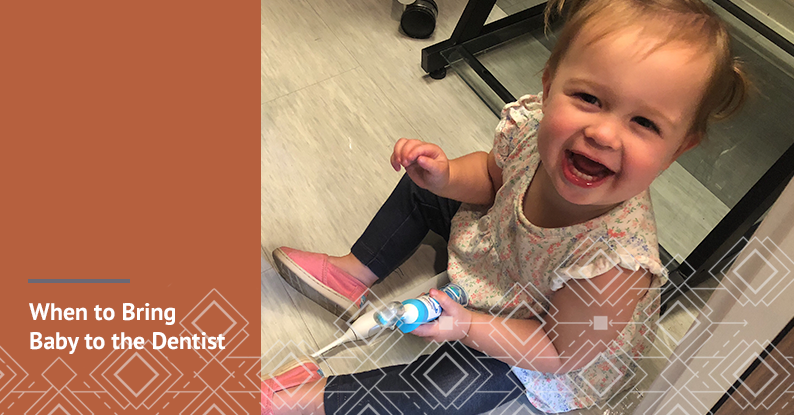 We understand that dental appointments can be a little scary, so being exposed to the dentist at a young age helps increase your child’s familiarity with the dentist making appointments a bit more comfortable. This is also an opportunity for first-time parents to learn about caring for their children’s teeth. Dentists will help you teach your child good dental hygiene habits. If your baby has their first tooth and is ready for their “Get Acquainted” visit, call us to schedule today at 785.776.0097. We are excited to welcome them into the Downtown Dental Group Family.